When your almost twenty-month-old kiddo loves to play school every day, you better darn well learn how to stretch a dollar. The Big & Easy Coloring For Beginners coloring book found at the Dollar Tree is a gold mine. The simplicity of the large drawings offer plenty of room for you to manipulate them for multiple purposes. 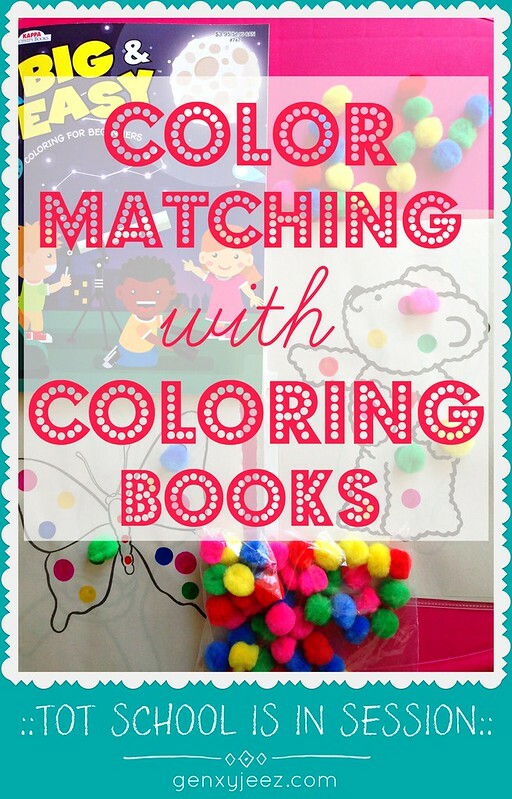 Pair it up with a package of pompoms from the next aisle over and you are set for this quick prep color matching activity! I not-so-carefully tore out a couple of pages (and I'm cringing looking at those edges in the photograph) and meticulously drew circles onto the images (using a stencil for crying-out-loud) using similar pompom colors, then popped those pages into clear sheet protectors (because I felt like being fancy). Sheet protectors give me life, and these ones from Amazon are the perfect price when you are pinching pennies. The goal is pretty clear: place a pompom on the same color dot. As you can see, I made up two of 'em with ALL the colors. I've since come down off my caffeine high and have narrowed in on the three colors we're currently getting to know. 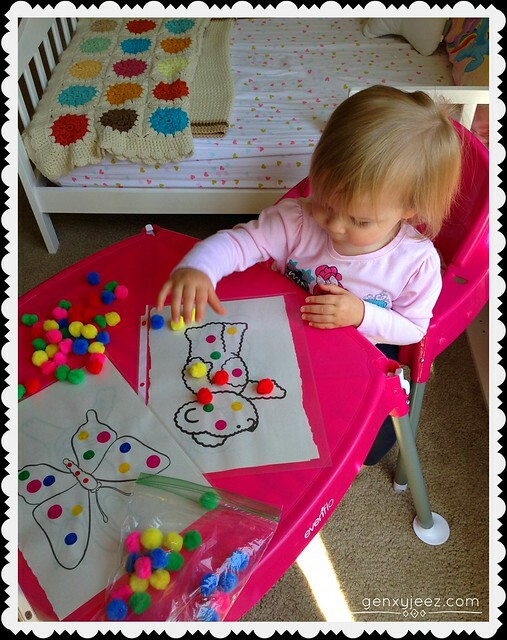 This combination of illustrated familiar objects, tactile of fuzzy pompoms, and her newfound fascination with color sorting captured Emilia's interest at once — and we have yet another win with a way to learn through play! I hear a paper-cutter calling me. 'Til next time my friends! When Emilia started correctly matching colors, shapes, and letters with lightning speed on a mobile game earlier this year, I made a mental note to self: Do not become Rick Moranis' character from the movie Parenthood. When we mentioned Emilia's brilliance last month at her eighteenth-month check-up, our pediatrician paused, raised an eyebrow, then said matter-of-factly, "She's going to be very smart." After several more weeks of Emilia playing educational games on the iPad (and showing me shortcuts for using Netflix), I wanted to see if she would apply the same interest in hands-on activities similar to those found in the apps. Our first attempt at recreating a color sorting game using stickers was an immediate success! Not only did Emilia understand the concept, but she also had a blast. Therefore, I'm giving tot school a try! Never heard the phrase tot school before? To be honest, I only just heard the term tot school three weeks ago. It's that new slang like tummy time. Tot school is basically introducing preschool skills to your toddler through play. It's the same way I started teaching Marissa at home twenty-five years ago except now there's a catchy hashtag. My focus at the moment is to create a happy environment in an area of our house away from distractions and that allows easy access to the fun things needed for a morning routine of stress-free home-schooling. 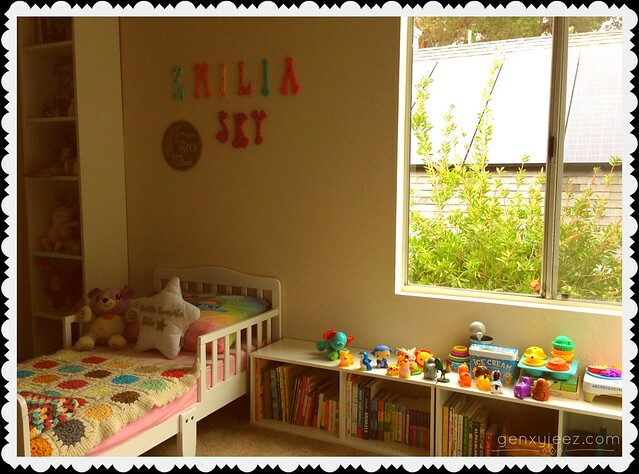 This just happens to be the master bedroom we share with Emilia. I started by taking all the battery-operated toys to the family room and keeping only books and pure-imagination toys in the bedroom with an exception of one or two that mostly play music. But no talking educational toys. During tot school, the ABCs are coming out from my mouth, not some turtle's. It's also awesome not to accidentally step on a techno-singing-dancing-alphabet-reciting-robot five minutes after finally getting the Little One to sleep! That's for mommy to listen to alone downstairs after her midnight cup of coffee. Second, I'm making the most out of our bedroom floor and wall space. Have you seen the home makeover show Clean House? 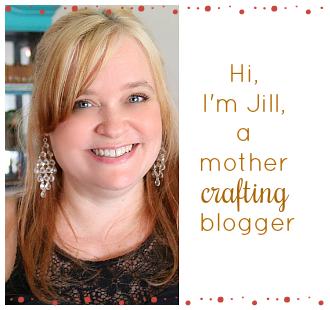 One of the things they do is take items from within the home to redecorate. That is, like, my life's calling. I pulled my white adjustable bookcases out from the closet and arranged them horizontal under the window so their long sides could also be utilized as a shelf too. Having them low to the ground helps make the room look less crowded and cluttered. And it's toddler-friendly by being at Emilia's eye level while playing on the floor. Oh, it also makes a cheap window seat! 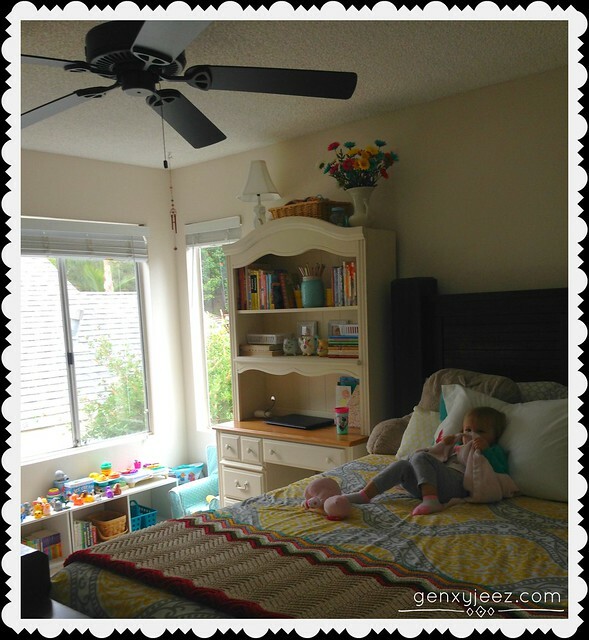 Fortunately when we first moved in we deliberately created Emilia's side of room nearest to the windows that provide natural light, a nice breeze, and peaceful view of the sky and palm trees. I've only had to tweak the arrangement of the furniture a little so that it encloses our little classroom area in a cozy way. 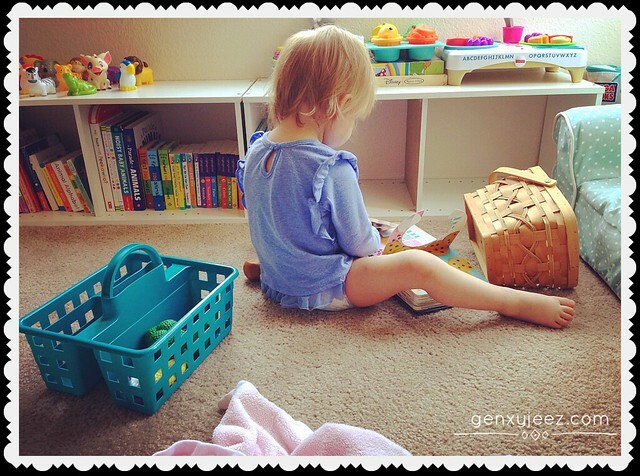 This helps keep playthings more confined and quicker to pick up and put away. Plus, her table fits ideally in this little cubicle I carved out. Now on the subject of her table, that was some foresight right there! The high chair I really wanted (and since bought) for the long haul wasn't in stock when we were ready to purchase one, so instead we went with the super affordable Evenflo Convertible High Chair so it could be used as a toddler table and chair in the future. It was such perfect planning. The height of the chair is safe and steady for independent sitting. The tabletop is wide enough for a variety of projects and wipes clean easily. And the color goes with the decor. Third, I'm keeping on theme with a shared color scheme. A common palette makes the room look more brought together. We all have bright tropical hues in our decor. I'm mindful of these colors when choosing storage solutions for school supplies and classroom-type wall decorations. It's also a great excuse to buy anything Moana. These decorating tips can keep your bedroom looking classy whether you're looking for a place to play school or simply sharing a room together.